For the next tens days leading up to the Holiday Trunk Show at the workroom, I’ll be introducing you to the lovely talent you can expect to meet. I hope you’ll take a peek here each day and then I definitely hope to see you at the show. Nothing makes me happier than seeing the workroom filled to the rafters with people who love, make and buy handmade. I’m especially smitten by all her pieces with insects. Have you always been crafty? Did you go to school for jewelry/glass? Tara : I think I have always been crafty, some of my favorite memories include needlepoint with my grandma at a very young age. (I wouldn’t know where to start if I tried it now though!) After high school I studied photography and years later I returned to school for glass art at Sheridan college. I currently blow glass at the Living Arts Center in Mississauga. Tara : I love bold colors and patterns and often look at fabrics even though I can’t sew. 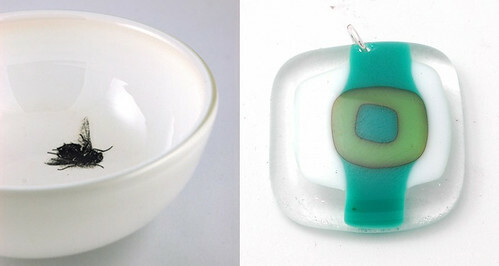 What is it about glass that you love? Tara : I love bold opaque colors and that makes much of my stuff not look very glassy, but I love the process. I love blowing glass in the winter- when it’s really cold outside, it’s always warm in the hotshop (it’s like standing in front of the sun) however it’s not as much fun in August. Who would you love to design a piece of jewelry for? Tara : That’s a tough one. I usually design my jewelry based on what I would wear and then just hope that others like it as well. But I would love to design cuff links for Don Cherry. Tara : I have a giant weakness for handmade bags, but more practically I would like a macro lens for my camera. Visit Tara’s etsy shop to see more of her lovely pieces. All photos are courtesy of Tara Gilchrist.